The Boston Terrier was bred in Boston, Massachusetts from an English Bulldog and White English Terrier. The breed was originally bred as a vicious fighting dog that weighed up to 44 pounds. The breed we know today originated from a dog known as "Hooper's Judge" who lived around 1870. Hooper's Judge was bred with a smaller female and their offspring were bred down even further to form the modern Boston Terrier breed. The breed was accepted to the AKC in 1893 and is still a popular breed to this day. The Boston Terrier was nicknamed the "American Gentleman" because of the breed's well mannered disposition. 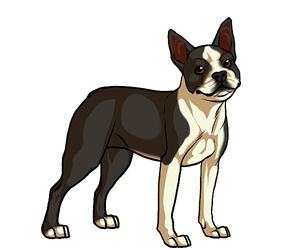 The breed was originally going to be called the "American Bull Terrier" but Boston Terrier enthusiasts did not agree with the name. The Boston Terrier was the first non-sporting breed created in America.